Contrary to popular belief, there is an astonishing quantity of creative upsurge of writing in Sanskrit today which is qualitatively of such high order that it can easily compare with Sanskrit writing in any century, including the Golden age of Sanskrit. Sanskrit being a Pan Indian Language, the writers are spread out along the length and breadth of the country. There are more than three thousand works available which are of a very high standard produced during the 20th century. An attempt is made in the present work to highlight the contribution of 250 Twentieth Century Indian Sanskrit poets who have made a significant contribution to one or the other form of creative writings in Sanskrit which convincingly disproves the criticism of some critics that Sanskrit is a dead language. Sri S. Ranganath secured First Class, First Rank in M.A Sanskrit from Bangalore University. He is the recipient of Hiriyanna Gold Medal and Hebbar Srivaishnava Sabha Gold Medal. The title Vedabhsana was conferred on him by Vedadharmaparipalanasabha, American Biographical Institute, U.S.A., has honoured him with the title The Man of the Year 1996. He has a Vidvan Degree in Advaitavedanta from Sri Chamarajendra Sanskrit College. He has studied Rgveda traditionally for eight years. His Ph.D. dissertation was on “Contribution of Vacaspatimisra to Indian Philosophy”. He has Forty books and Eighty research papers to his credit. His Kannada translation of Prof. Satya Vrat Shastri's Ramakirtimahakavyam was published in Bangkok (Thailand). He is Professor and Head of the Department of Sanskrit, N.MKR. V. College for Women (Autonomous College) Bangalore. He was awarded D.Litt., from Himachal Pradesh University, Shimla in 2005 for his Post-doctoral publications on Post Independence Sanskrit Literature. World Association for Vedic Studies, USA., (Bangalore Branch) has honored him with the title Vedasri. Ministry of Human Resource Development, Govt, of India has nominated him as the subject expert (member) to managing committee of Ahobila Mutt, Adarsh Sanskrit Mahavidyalaya, Madhurantakam (Tamil Nadu) for 3 years (2008-2011). He has a Rastrabhasavisarada degree in Hindi from Madras (Chennai). Contrary to popular belief, there is an astonishing quantity of creative upsurge of writing in Sanskrit today which is qualitatively of such high order that it can easily compare with Sanskrit writing in any century not excluding the Golden Age of Sanskrit. The sheer amount of Published Work in all fields of literary activity is truly mind boggling. Sanskrit being a pan Indian Language the writers are spread out along the entire length and breadth of the country and as in ancient days from Kasmir to Kanyakumari from Bombay to Calcutta a large number of extremely talented poets have been practising the Art of Creative great Literature in the Sanskirt Language. Whether it is Epic or Drama, Campu, Prose, Gitikavyas, Dutakavyas, Katha Sahitya, Lyrics, Stotra Kavyas, Travelogues or Citrakavyas, there are more than Three Thousand works available which are of a very high standard. An attempt is made in this work to highlight the contribution of 250 Twentieth Century Sanskrit Poets who have made a significant contribution to one or the other form of creative writings in Sanskrit which convincingly disproves the criticism of some critics that Sanskrit is a dead language. 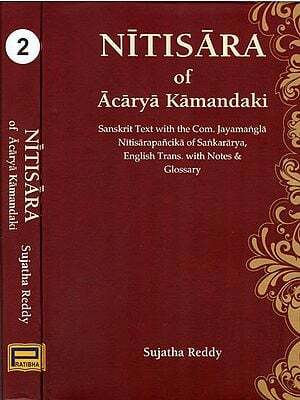 I felt a need for this book as there was no work of this kind in English to my knowledge which will be like a ready reckoner to any researcher who may be pursuing his research in 20th Century Sanskrit Literature or the contribution of the 20th century Sanskrit Poets available to them in one place. The methodology uniformly employed in this book is to state the poet's date of birth, his family, his place of work, his qualification, his creative as well as critical writings, the honours and awards which he might have received and a brief conclusion of each poet based on the overall contribution made by him. (1) 1875-80 (2) 1881-90 (3) 1891-1900 (4) 1901-1910 (5) 1911-1920 (6) 1921-1930 (7) 1931-1940 (8) 1941-1950 (9) 1951-1960 (10) 1961- 1970 and miscellaneous. Under miscellaneous head, sixty poets figure in this work whose date of birth is not known definetly, but certainly who belong to this century. The work commences with the date of birth of the poet starting from 1875 onwards whose work published would be certainly from 1900 onwards. Thus the work stretches from Krishna Chandra to Ravindra Kumar Panda (29-9-1875 to 10-01-1963). The work highlights the contributions made by the poets who have received Central Sahitya Academy Awards, Vacaspati Puraskar instituted by K.K. Birla Foundation Delhi, Jnanapeeth Puraskar, Poet's Laureate of the respective States Mahamahopadhyaya conferred by Rashtriya Sanskrit Vidyapeetha, Tirupati, Padmasri conferred by Govt. of India and so on. (1) Prof. Ramakaran Sarma (Vice Chancellor of two Sanskrit Universities-Sampoornananda Sanskrit University, Varanasi and Darbhanga Sanskrit University, Ex-Director, Rashtriya Sanskrit Sansthan, Delhi, President International Sanskrit Association and Visiting Professor to the Universities of Columbia and California, Recipient of Sahitya Academy Award and Vjicaspati Purskar. (2) Prof. Satyavrat Sastri (Ex-Vice Chancellor Sri Jagannath Sanskrit University, Purl, Visiting Professor to many European Countries, recipient of eleven International Awards, Padmasri from Government of India and Mahamahopadhyaya from Rashtriya Sanskrit Vidyapeetha, Tirupati and youngest Sahitya Academy awardee at the age of thirty seven. (3) Prof. Rajendra Misra (Ex-Vice Chancellor Sampoornananda Sanskrit University, Varanasi), Visiting Professor to University of Udayana, Bali, Indonesia, recipient of awards like Sahitya Academy Award, Vacas-pati Puraskar and President's Certificate of Honour. (4) Prof. V. Raghavan, Visiting Professor to many Universities abroad, Padmabhusana Awardee, Sahitya Academy Awardee, Editor of Catalogus Catalogorum and so on. (5) Prof. Pullela Sriramachandrudu, winner of Sahitya Academy Award and recipient of Mahamahopadhyaya, Honour from Rastriya Sanskrit Vidyapeetha, Tirupati. (6) Dr. Visvanatha Satyanarayana, Poet Laureate of Andhra Pradesh, Jnanapeeth Awardee and Kavi Samrat. (7) Prof. Radhavallabha Tripathi, winner of Sahitya Academy Award, and Visiting Professor to Universities of Germany and Thailand and present Vice-chancllor of Rastriya Sanskrit Sansthan, New Delhi. (8) Prof. K.T. Pandurangi, Vice Chancellor, Pooma Pragna Vidyapeetba and recipient of Mahamahopadhyaya Award from Rastriya Sanskrit Vidyapeetha, Tirupati. (9) Pandit Pandarinathacharya Galagali recipient of Rajya, Rastra and Rastrapati Puraskar. (10) Prof. N.Ranganatha Sarma recipient of President's Certificate of Honour and Mahamahopadhyaya from Rastriya Sanskrit Vidyapeetha, Tirupati. (11) Prof. S.B. Raghunathacharya, the Dynamic Ex-Vice Chancellor of Rastriya Sanskrit Vidyapeetha. (12) Prof. Rasik ViharI Josi, Visiting Professor to many Universities abroad and Winner of Sahitya Academy, Vacaspati Puraskar and President's Certificate of honour and so on. The Contemporary Sanskrit Poets have through their poetry been successful in depicting the social evils like Dowry deaths, Bribery, Corruption, Suicide, Problems of Unemployment, Exploitation of the poor and downtrodden, Terrorism and so on. They have been successful in combating these social evils by giving possible and plausible solutions to them. Mahidhara Venkatarama Sastri's Sarojini Saurabham, H.V. 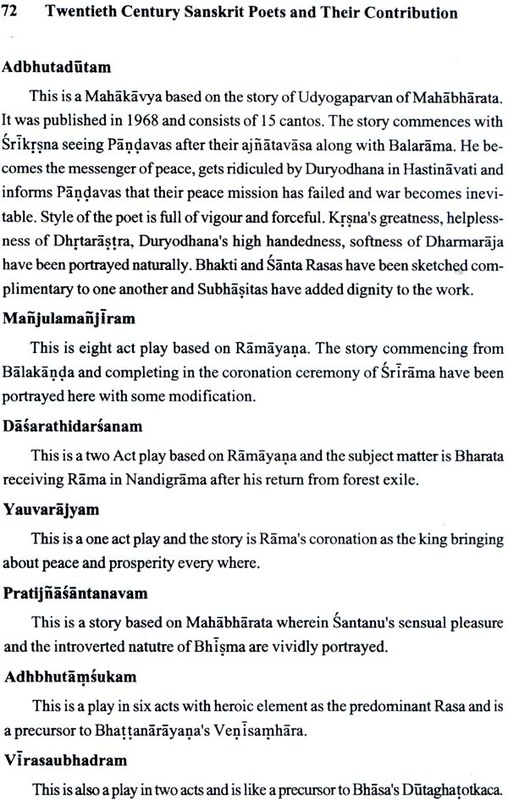 Narayana Sastri's Gunapariksanam, Dipak Ghos's Vilapa Pancasikha Social plays of Ogeti Pariksit Sarma and Bhagirathi Prasad Tripathi's Atankavada Satakam are pointers in this direction. Patriotism and Nationalism also occupy a significant trend of Modem Sanskrit Poetry wherein we find works being composed on Religious and National Leaders Like Tukaram, Jnanadev, Ramakrsna Paramahamsa, Vivekananda, Sivaji, Lala Lajpat Roy, Jawaharlal Nehru, Mahatma Gandhi, V.D. Savarkar, Saradar Patel, Ranapratap Indira Gandhi, Rajiv Gandhi and so on. Creative Literature in Sanskrit during 20th Century in our country has got a new fillip with an unprecedented enthusiasm observed with the poets and authors of Sanskrit of the concerned era The factors responsible for giving a boost to the Sanskrit poets of twentieth century included the components like encouragement to the creative artistes by several public as well as private agencies, increase in the degree of acceptability of Sanskrit writings and after-all getting nearer to the mainstream of the nation through the creative literary art of Sanskrit. In fact, the Sanskrit Poets of this century have tried to portray themselves as the creative chronicles of the happenings of their time of the society instead of becoming imaginary narrators of the Utopian world. Hence a congenial environment in the 20th Century has given rise to a number of creative literary artistes in Sanskrit, who have, no doubt, enriched the history of Sanskrit literature in various ways. Professor, S. Ranganath, a well known versatile genius in the field of Sanskrit deserves our appreciation for selecting such an interesting area as the central theme of his present volume entitled “20th Century Sanskrit Poets and their Contribution” (Vol-l). The present work consists of seven chapters depicting the unique and original contributions of Sanskrit poets flourished from 1875 to 1930 in various places of the country. The author, Professor Ranganath has taken a lot of trouble to identify the talents, collect their works in Sanskrit, analyse the central ideas reflected in the works and project the same in a chronological and methodical manner in his books. By doing so, the author has, no doubt, shown his respect for the poets and appreciation for their works with a noble intention of updating the history of Sanskrit Literature in the larger interest of the readers, researchers, learners and critical assessors. Hence it goes without saying that the present work will be a very useful and meaningful addition to our treasure of tradition. My heartfelt congratulations to the author, Prof. Ranganath for his successful endeavour in right direction and that too at right moment. Rashtriya Sanskrit University, Tirupati an internationally reputed Public-funded organization; has been striving hard from its inception for promoting Sanskrit literature and propagating Indian culture in the country and aboard through its hydra-headed academic and research activities. It has traversed a long journey of nearly five decades with a unique experience of struggling hard for a noble cause for which it was set-up. Thanks to those founders, well-wishers, teachers, researchers, administrators and learners, who have brought this University to this coveted stage of respect and reverence by contributing a lot to its corporate life at various points of time for which, today, we are celebrating the Golden Jubilee Year. To mark the Golden Jubilee Celebration, we have planned to organize a number of academic and cultural programmes out of which the proposal for publication of fifty standard books in and on Sanskrit stands pre-eminent. We are extremely happy to mention that this publication forms a part of that Golden Jubilee publication. Hence, the concerned publication has not only ensured and strengthened the quality of the Golden Jubilee Publication series, but also enhanced the dignity of our University. May I avail this opportunity to thank all those who have got themselves associated with this publication and wish the publication a success while expecting many more meaningful works from our revered author in future. This gives me great pleasure to introduce the monumental work entitled 20th century Sanskrit Poets and their contribution (Volume - 2) to the Sanskrit loving world. India has a vast treasure of Sanskrit Poets who enhanced our nation's prestige and reputation in the global scenario of poetics. Prof. S. Ranganath authored this work with enormous endeavor and mental strain for collecting data's regarding these scholars of different regions. This work highlights the names of prominent contributors in modem and classical Sanskrit literature. This also gives narrative description about the poetic works along with various authors history. This is an authentic Suivey of the poets of 20th century. This volume contains chapter 7 to chapter 10. Our Viydapeetha has already published the first volume of this work recently. This work fulfills the long standing desire of the Sanskritists to know the history of Sanskrit scholars and the poets in particular. The Sanskrit speaking world should undoubtedly be indebted to Prof. S. Ranganath for bringing out these two volumes on Sanskrit poets. I, with all pride and humanity appreciate Prof. S. Ranganath for coming forward to give an opportunity to the Vidyapeetha to publish his finest work under the banner of Golden Jubilee Publications. I wish to thank Prof. K.E. Devanathan and other colleagues for bringing out this work.